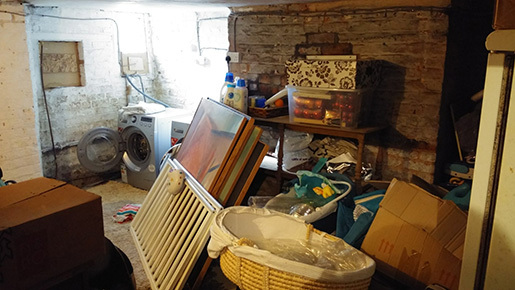 Today I'm have sharing an insight into the darker side of renovation - literally. 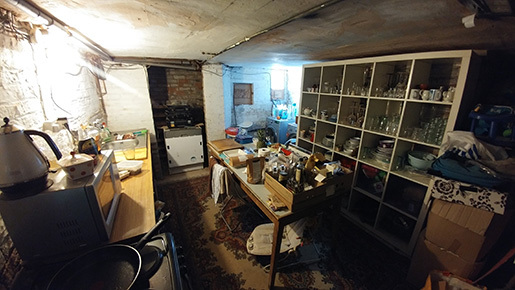 We have been living in the house during our building works - because the work is taking place entirely on the ground floor, moving out would have added unnecessary cost, and even if we'd wanted to move out, I doubt we'd have found a short-term let locally that allowed dogs. Having lived through a two-month kitchen renovation at our old house with only a microwave and a panini maker, I was adamant that we would not be spending weeks and weeks washing up in the bath and feeding the children takeaways this time round. My favourite part of the room is the baby bouncer that lives under the table, air-raid style, to prevent plaster raining down from the ceiling onto baby Elodie's head. The room used to look like this so we had a lot of clearing to do first! Actually it's not too bad. We've got a sink, washing machine and tumble-dryer, fridge-freezer (which joy of joys is in the same room as the rest of the working triangle for the first time in four years), electric oven, worktop space, microwave, toaster, kettle, and all our crockery and china; the latter thanks to Andre who painstakingly removed everything from the shelves, dissembled the Ikea unit, took it downstairs, reassembled it, and then took the china and glassware downstairs piece by piece and placed it back on the shelves (meanwhile I rested peacefully upstairs with eight-week old baby Elodie). The only downsides are the fact that it's absolutely blooming freezing when it's cold outside, to the extent that you need to wear a parka while cooking (although quite pleasantly cool during the occasional scorchio day we've enjoyed recently,) it's a pain carrying trays of food upstairs Victorian-style to the bedrooms where we are mostly living, and our beloved Gaggia doesn't work as well as it should due to the colder ambient temperature. Middle-class problems... :-) We've managed to muster up some fairly decent chop, mind, despite the slightly unpropitious circumstances - including pulled pork (cellarpulledpork), espresso (cellarspresso), pizza (cellarpizza), and so on. Various lovely friends have also taken pity on us and provided delicious homemade meals to be warmed up, or invited us round for Sunday lamb or Spanish-style tapas. Thank you all! I'm glad I didn't actually live here during the Victorian age, as I'd almost certainly have been a scullerymaid (if I was lucky) and spent most of my waking hours down here. 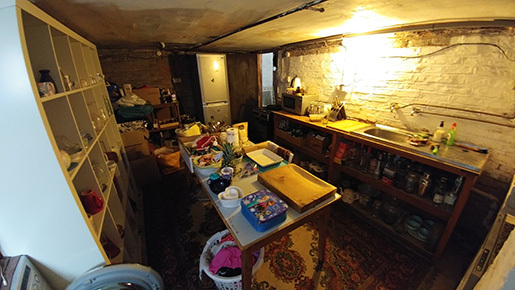 Mercifully, the plasterers have nearly finished so we're planning to relocate the temporary kitchen into the new kitchen space while we gradually install the new kitchen units.